… and then carry on reading below. On a simplistic level, from this side there is only one angle of view along which you can obtain separation between the windmill and the lifeboat station (the dark building on the right). A few steps to the left or right and there is no separation. Along this angle of view, a few steps forward or back changes the relationship between the two main elements in the image – the windmill and the street light. The bench in the foreground plays a part as well.The street light is always going to look down on the bench because they are close to each other. The bench is facing away from both of the windmill and the street light (it’s actually facing across the river Ribble towards Southport). From a distance, the windmill will be portrayed as you would expect – it is much larger than the street light and would dominate it – but as you walk towards the street light, its proximity to the camera allows it to appear much larger in the image to the extent that it can now look down on the windmill. The actual position I chose allowed the street light to look directly down the diagonal provided by two of the sails of the windmill. Thoughts along these lines give rise to the saying “your feet are your best zoom lens”. 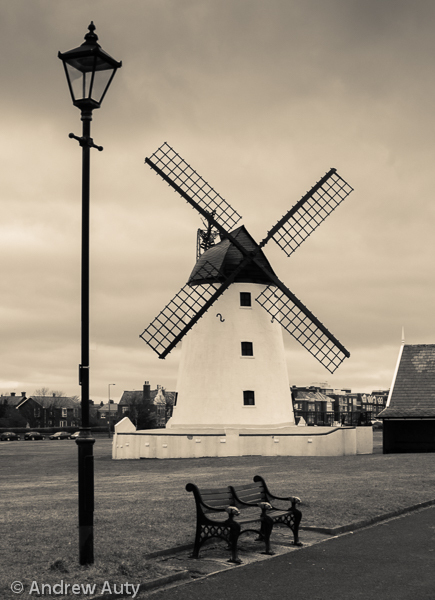 This entry was posted in Favourite Images and tagged Lytham Windmill on 24th March 2015 by Andrew.